The clearance of forests to be used for other purposes induces a wide range of environmental consequences. 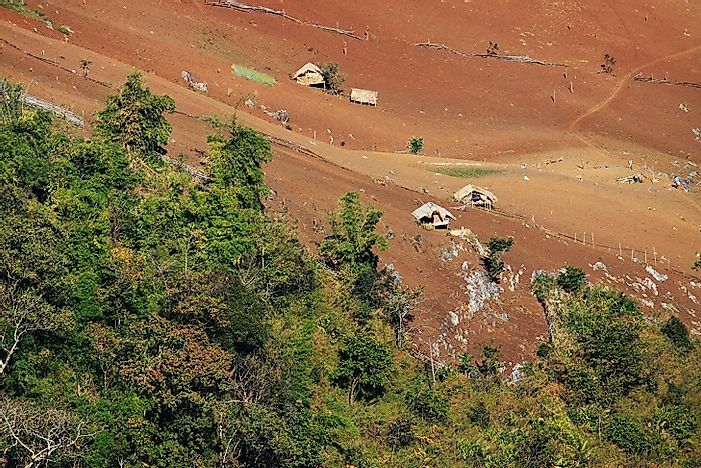 Former jungles that have been clear-cut and left desolate in Myanmar. Deforestation turns once vibrant areas and vegetation into desolate and barren lands. The results of such processes are that incidences of food insecurity, land degradation, and climate change proliferate. However, deforestation can be fought against through various conservation and mitigation measures. Forests occupy 31 percent of the earth’s land area. They are wildlife habitat, and 1.6 billion people, primarily depend on forests for food, water, traditional medicine and other secondary benefits, like shelter, tourism, construction, and others according the World Wide Fund for Nature (WWF). But deforestation is decimating forests at an alarming late. According to National Geographic, annually, forest cover the size of Panama is lost to deforestation. Agriculture is the biggest cause of forest habitat loss which among small scale farmers comes in form of slash and burn, where trees and vegetation are cut down and burnt. Other factors include, ranching, unsustainable logging, degradation due to climate change, and industrial development like mining on forests. Loss of vegetation cover through deforestation causes soil erosion which may result in desertification. Increased demand for agricultural produce is resulting in negative human activities where land’s natural vegetation is cleared, to make way for crops like maize, coffee, cotton, soybean, palm oil, wheat and others. As a result, the new vegetation in form of crops, does not properly anchor the soil, resulting in soil erosion. According to the World Wide Fund for Nature, in the last 150 years, half of the planet’s fertile top soil has been lost. Researchers report soil erosion increases pollution, causes sedimentation in rivers and streams, clogs waterways, and causes aquatic species to decline. About 10 million hectares of cropland are lost annually to soil erosion, according to a study by the College of Agriculture Cornell University. Deforestation accelerates global warming. According to the Food and Agriculture Organization (FAO), trees are 50 percent carbon, so when they are felled or burned, the carbon dioxide (CO2) they store escapes back to the atmosphere. An estimated 15 percent of all greenhouse gases like carbon dioxide are as a result of deforestation according to the World Wide Fund for Nature. Forests acts as vital carbon sink as they absorb carbon dioxide from the atmosphere which contributes to climate change. Though deforestation is associated with decreased rainfall in some instances the reverse happens. According to NASA studies it can increase rainfall due to the creation of heat islands that improve the rising and overturning of air (convection) thereby causing clouds and rains. That’s because clouds and rainfall get concentrated where forests have been cleared. Disruption of water cycles also happens because of deforestation. Trees control the amount of water in the atmosphere, soil and ground water. They draw up groundwater by their roots and release it into the atmosphere using their foliage to sustain the hydrological cycle. Roots serve as a conduit in the soil that facilitate water infiltration into the ground and leaves capture rainfall and precipitation which re-evaporates back into the atmosphere. Leaf litter and other organic residue from trees cover the ground and increase its capacity to store water. Fewer trees mean less the water in the atmosphere to be returned to the soil, this results in dryer soils where crops can’t be grown, according to Pachamama Alliance. Deforested areas cannot retain any moisture in the ground or atmosphere leading to dry climate and eventually desertification. Reforestation is a solution to counter deforestation. It involves replanting trees in sections of forests where tree covers have been cleared. Reforestation is vital where forests cannot regenerate naturally due to severe land degradation, and trees have to be replanted by hand. To preempt deforestation, organizations like Conservation International (CI) have worked for over 30 years to ensure over 40 million hectares of forests are protected. Conservation International works in Sub-Saharan Africa, Latin America, and South East Asia where incidences of deforestation are high.